You may have seen that we’ve recently commented on the Highways England Funnel Bin project in the press. We’ve had some passionate feedback – both supporting and challenging our comments. Thank you to everyone who has fed back – we appreciate the time you’ve taken to do so. We thought we’d write about the bigger picture. It’s almost impossible to present important detail in a few minutes of radio show or a TV clip which has been thoroughly edited! At Clean Up Britain we completely agree that more bins are generally a good thing when the right type of bins are put in the right places and emptied often enough so they don’t overflow. That said, we’ve been up to our eyeballs in litter for a few years now and, unsurprisingly, it’s a complex topic for which the solutions are not straightforward. Through our work and lobbying we’ve learnt that to properly address our growing litter problem a multi-pronged, long-term approach is needed. A combination of campaigning and communications, education, innovation, consistent enforcement and the right bins in the right places. Our friend Peter Silverman of Clean Highways has been campaigning tirelessly to motivate Highways England who he asserts fail to comply with their statutory duty to keep their land clear of litter and refuse. Do have a look at his website to see the extent of his challenge and his work. We also had a couple of practical concerns – so many people who buy food from services eat in transit, so extra bins aren’t necessarily capturing the rubbish that ultimately ends up on verges away from rest stops. Also, some of us are a pretty bad aim – which potentially means a litter problem in itself is created as people miss and the wind does its job. Of course we support all positive action to address litter and agree that the problem lies largely with the person who drops it. However, a balance needs to be struck in public discussion on the topic and the bigger picture acknowledged. What we really need is long term plans, investment and commitment to address the fact that motorway verges the length and breadth of Britain are strewn with litter. 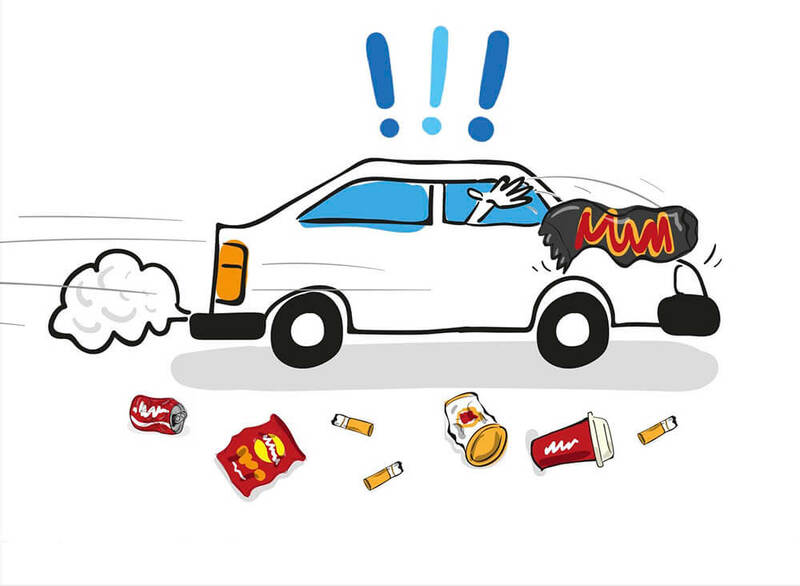 We promise to keep campaigning and lobbying for a holistic approach to address our litter problem. We’re a member of the government’s Litter Advisory Group and continue to meet with civil servants, parliamentarians and Ministers in an effort to help drive long-term change. If you’re interested you can read the Litter Strategy for England here. We’ve also embarked on a further program of work to practically address some of the needs we see as priority, which we hope to be able to go public on early next year. As we progress feel free to hold us to account, ask us questions, give us challenges. We will always listen and respond. Simply pick up a piece of litter every day. When people see you doing it, stand proud and keep going. What you’re doing is helping create a new social norm. Research shows that if people see others picking up litter they are less likely to drop it themselves. Contact us for a copy of our straightforward and fun KS2 educational resources developed with, and aimed at 8-11 year olds. Suitable for schools and community groups who want to spend an hour on the topic and inspire their kids to do the right thing. Start a dialogue with the council. If litter starts to build up things will only get worse. As we’ve discussed, clean, well loved spaces are more likely to stay that way and the reverse is also true. Encouraging your local council to maintain clean spaces helps get the battle won. Littergram can help you with this. Lobby the government. Contact us for some guidance which highlights what we feel are the key needs and issues not fully addressed in the Litter Strategy for England. Every voice helps. Copy us in so we can keep a track of who else is getting involved. Check back on the website where we will keep our news updated and publish more details of how our supporters can help as time goes on. Many thanks, the team at Clean Up Britain.